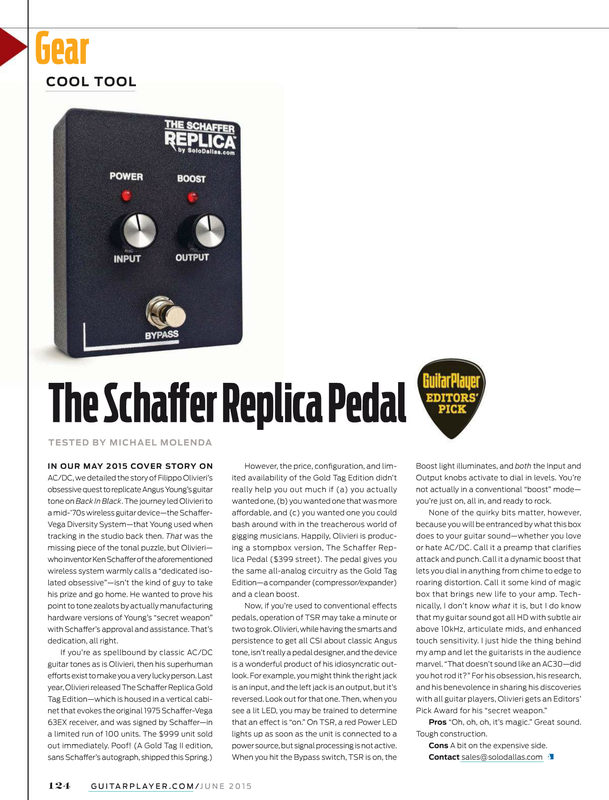 The Schaffer Replica is a unique instrument effects unit with an equally unique backstory. Spanning four decades, three continents, and involving a world famous rock guitarist, a prolific inventor and an obsessive music fan from Italy, there is an almost cinematic quality in the narrative that traces the steps taken to reintroduce the world to the captivating tone that may have otherwise been lost forever. 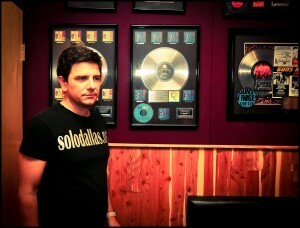 Born in Texas, but raised in Rome, Fil Olivieri, founder of SoloDallas, had been obsessed with AC/DC’s Back in Black (the second best-selling album ever with 40 million sales worldwide) since its release in 1980. In a quest to replicate the album’s distinctive guitar tones, Olivieri began purchasing the same equipment used by lead guitarist Angus Young (late ‘60s/early ‘70s Gibson SG guitars, late ‘70s Marshall amplifiers), but as close as he got, it was obvious there was still a key ingredient missing. For three decades, Olivieri was stumped, until he happened upon a 1984 interview in which Young was asked if he uses any effects in the studio. Young answered, “No, I just use a Schaffer-Vega [Diversity System].” Puzzled by the response, Olivieri wondered why anyone would mention a wireless system as an answer to a question regarding effects. Wireless systems help musicians run around on large stages without getting tangled in yards of cables, but they don’t manipulate actual tone . . . right? Typically not, but this case was far from typical. Young further explained in the interview that the Schaffer-Vega Diversity System (SVDS) had two controls on it with which one could further overdrive the amplifier, thus “giving the guitar hell”. Olivieri at that moment discovered the missing link to Angus’ elusive tone. 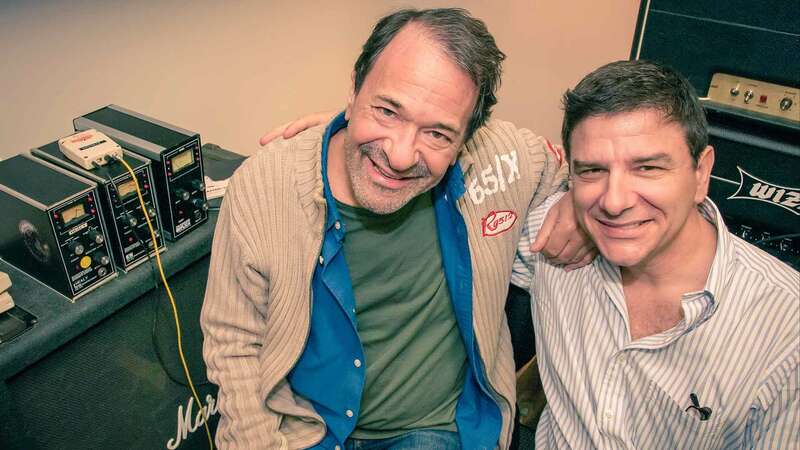 Flashback to 1975: New York-based recording engineer-turned publicist Ken Schaffer had moved on from the record business in order to focus on being a full-time inventor. Introduced that year, his Schaffer-Vega Diversity System was catching on with some of the big names in rock. One of the early adopters was KISS, whose motivation was one of practicality since guitarist Ace Frehely once had to be revived after having been shocked by a guitar cable connected to an ungrounded amplifier. Within a few years, you couldn’t throw a brick in a room full of household name guitarists and bassists without hitting someone who was using the SVDS in a live setting; Eddie Van Halen, the Rolling Stones, Bootsy Collins, Peter Frampton, Frank Zappa and numerous others were all SVDS users. However, Schaffer designed it to boost low-mid range frequencies usually lost in wireless transmission, as well as to compand (compress then expand) the signal, thus providing the added side effect of enhancing the instrument’s tone. Numerous groups decided that, apart from serving its basic function, the SVDS also sounded good and began using it as an effect in the recording studio – namely Electric Light Orchestra, Pink Floyd (The Wall) and, of course, AC/DC, beginning with 1978’s Powerage. By 1982, after becoming interested in other endeavors, including intercepting internal Soviet television for the U.S. government in the waning days of the Cold War, Ken Schaffer had stopped producing the SVDS after roughly 1,000 had been built. Thirty years later, he was caught off guard when Fil Olivieri, a total stranger, e-mailed him asking about the long-forgotten SVDS. After many heart-to-heart conversations, Schaffer felt inspired to give Olivieri his last two functioning units. Says Olivieri, “I thought that many more people deserve and want that tone. The idea of a one-to-one audio replica of this great system came to be born.” With Schaffer’s blessing, Fil hired a team of electronics experts to reverse engineer the SVDS to re-create it in the form of a non-wireless unit, under the company name SoloDallas and the first units rolled out in 2014 – The Schaffer Replica was born. The saga came full circle last year, when Schaffer brought Olivieri to meet his old friend Angus Young at the Warehouse Studio in Vancouver, at the start of sessions for AC/DC’s latest Rock or Bust album. Olivieri presented Young with The Schaffer Replica GT #001, the very first unit produced. The Scottish-born Australian guitarist was so impressed how perfectly this device reproduced his signature tone, he ended up using it all over Rock or Bust. It is AC/DC’s first album since 1983 to employ “the Schaffer Sound” and is now being used on the band’s Rock or Bust World Tour. The Schaffer Replica’s reputation within the music community has grown steadily. Gilby Clarke (Guns N’ Roses), Phil X (Bon Jovi), Elliott Randall and Steve Stevens are among its current adherents, but its appeal isn’t limited to guitarists/bassists or even rock musicians. Recording engineer Clint Gibbs (whose credits include Shakira, Miley Cyrus, Nicki Minaj and Wiz Khalifa) is finding new applications for the effect in the studio, mainly with keyboards. 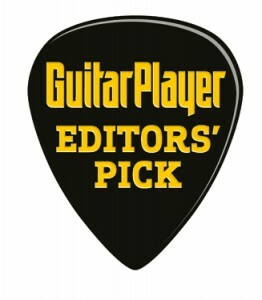 The Replica is available as a Tower (a virtual doppelganger of the ‘70s unit) or as a Pedal, aka “stomp box.” It received the Editors’ Pick award in the June 2015 issue of Guitar Player, where its qualities are described as “some kind of magic” by the editor. The sound created by The Schaffer Replica cannot be achieved by other means, and is nearly impossible to describe, but anyone who is remotely familiar with Back in Black knows it when they hear it.